Our Pursuit of Perfection | Free Money – I love it!! When you look outside the US, there are better opportunities with least risk. Especially for many of us who have ties to India or other emerging markets. As we know, there are differences between the developed and developing economies. The developed countries have very low growth with low inflation, developing countries have it just the opposite i.e. higher growth at the cost of high inflation. We can use this differential to our advantage. For example in India, you can park this money in Fixed Deposits that offer 9-11% interest rate. Even if you take the taxes into account, you’re still left with 6-8%. The major banks in India are much safer than the ones in US as they’re regulated and have tighter controls. Want higher return? Think of Real estate or Equities. This even works better for folks who are planning to return to India at some point or can use this money for parents or charity in future. In other words, they are not planning to bring money back to the US as some might not want to deal with the repatriation issue. So what are the other factors that make this offer more attractive? Exchange Rate: The dollar has gotten much stronger lately, almost 9-11% higher than the average rate, mainly due to Euro zone troubles. High inflation: The inflation continues to remain high in India, which means higher rates for your deposits. Low interest rates in the US: Fed has decided to keep the rates low for another two years. It is rare that you get such a long commitment. Now it is possible that any of the above factors (especially the first two) might change, making this offer less attractive. So make the most of it while it lasts!! Don’t want to go overseas looking for higher return? Fine. But you have to be more creative!! Loan money to others or start a business or experiment with an idea that you’re passionate about. Any disciplined investor or a businessperson would love to borrow funds at a cost this low. 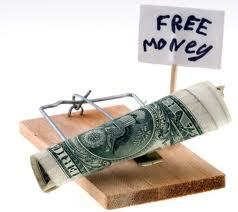 For them, it is Free Money!! This entry was posted in Get Rich and tagged Balance transfer, Free Money, investing overseas, opportunity, Risk Free on September 17, 2011 by admin.